I am a 35 year old female. I have what appears to be a cyst on the side of my foot... just diagonal from my ankle. I actually had a cyst on the same foot about 12 years ago... it was above my big toe and I had it surgically removed. So, I thought that surely this is what I'm dealing with again. I have been to my general practitioner who agreed with me that it may be a cyst... she sent me to the podiatrist who said, yes, it appeared to be a ganglion cyst and that we could schedule to have it removed. We decided to wait until after I got back from vacation. Then... after the "cysyt being there for nearly 2 months with no change in size or shape or anything else... 4 days after the appointment with the podiatrist is just disappeared. It was completely gone... no bump and not even a twinge of pain. It was completely gone for 2 full weeks. Then it started to come back. The first time it just appeared and stayed that way. But, this time... it took nearly 2 weeks to get in the state that it is currently in (see picture). There would be a bump one day and then it would go down. It would be soft at times and hard at other times. It would even go down some with massage. Now it's causing pain again and instead of just one bump it is now one main bump and a smaller secondary bump right next to it. I do work out regularly... step aerobics and other cardio 3 to 4 times a week (and hour each time)... I'm wondering if the impact has anything to do with this. Also.. there was no change in my regular activities between when the cyst was there and the time it was gone and now. Could it still be a cyst? Or is it something different? I will probably go back to the podiatrist again... but, we're in the middle of soccer season with 3 kids playing soccer... so, it may have to wait a few weeks before I have the time to go in. I am hoping to find some possible answers before then... or at least some possibilities. Thank you. I would certainly think your activity has something to do with the varying size of the cyst. Before I would have it removed surgically, I would have it drained and then see if it recurs. Most bumps on the side of the foot are more bone in nature then soft tissue masses. They can occur on the inside or outside of the foot or both feet. Similar appearing bumps on each foot will usually be bone in nature, while a bump on the side of one foot that it is not present on the other foot, will tend to be a soft tissue mass. Keep in mind there are exceptions to this rule. Many of these bumps can be painless. When painful, bumps on the side of the foot will generally hurt from shoe pressure. To further muddy the waters, soft tissue masses such as bursal sacs (bursitis) can "grow" over bony prominences. A typical example of this would be a bunion. If you press over a bony prominence and there is a spongy feel to it, then there is a good chance there is also a soft tissue mass. Bumps that appear spontaneously, whether they hurt or not, should be examined by a doctor. This may be a late comment about a foot that is painful when you first get up in the morning or after sitting for awhile. A few years ago I experienced the same thing. It was Plantar Faciitis. The Podiatrist fitted me with orthotics and within a couple days all was well. It is sometimes helped with an anti-inflammatory. I am thinking you might have what is called a piezogenic papule. 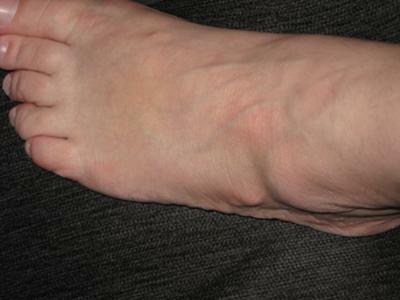 subcutaneous fat protruding through the fascial lining of the heel. sound easy! Hope this helps. I read your post about the bump... since I have the same bump on the same foot. Like you I exercise and noticed it the other day. it hurts slightly, but only because I have pushed on it since noticing it. So did you end up having it removed? I have the same kind of pain where it hurts more when I first wake up and stand... I was told by others that is a bone spur, but I was also told edema can do the same and cause an actual large fluid filled lump... which I also have.. I was worried whether it was hematoma or Edema but my dad has edema and said it sounds like and appears to be edema.. I have not yet been to the doc but I think I have both bone spurs and heel spurs, and edema..
hope it goes away soon. I was amazed to find your post as I have nearly the exact same symptoms, bump on the side of my right foot, etc. I'm 42 & teach fitness classes, (step aerobics, weight conditioning, etc.) I have not yet been to the Dr. about this but due to increased pain recently, I have thought I probably will make an appt. I was just wondering if you experience more pain when you first hit the floor in the morning and after you've been sitting for awhile & then stand. This is the case w/me. Like you, we are busy with three kids' activities, and I thought I might just wait to see if this subsides before going to the Dr. I also have a ganglion cyst on my wrist, which I had drained by a surgeon once, but it returned within a month, so I have now just left it alone. It usually doesn't bother me too much. I'm hoping that's what this is on my foot and that it will also become less painful soon. Hope yours goes away for good soon!